Hope I can share my Elan experiences to all the members. Attached is my KIA ELAN (1997) with original Emerald color. PS1. Indeed, in Korea only 1,077 Elans were built by KIA from 1996-1999. What I heard is now about 300 Elans are in the road. Last edited by Chris_K on Mon 17.04.2017, 04:54, edited 2 times in total. Nice colour - not sure we had that in the UK ? Looks very much the same colour as Medina Green (S2's only) to me ? Rambo wrote: Looks very much the same colour as Medina Green (S2's only) to me ? half a Medina Green S2 sneaking into my avatar on the left ..
What an international forum this is... Welcome aboard! simonbuk wrote: Nice colour - not sure we had that in the UK ? Above acronyms are codes for Elan color. Last edited by Chris_K on Mon 17.04.2017, 02:24, edited 1 time in total. Than's very interesting - the Median Green color. Can you upload the pic of medina colored Elan? HJ2 wrote: What an international forum this is... Welcome aboard! HJ2: Thanks for your warm remarks! Indeed, ELAN is an international classic car. Colours are a nightmare! I took a 'non-cheap' Nikon DSLR to Brands Hatch for 2016 Lotus Weekend so huge choice of colour programs for shooting, but also variable after shooting dependent on whether printing on paper or viewing on screen, and what screen, etc, etc ... so here's a small crop of a bigger photo. Chris, just noticed your Kia Elan has a really dark tint to the windscreen that would probably be illegal in UK. Is that how Kia made them and do the side windows have the same tint? Hi Rambo, Thanks I presume the color is a little bit different from KIA Elan. Still it is awesome - Thanks for your information. lotusflasherman wrote: :agree: Colours are a nightmare! I took a 'non-cheap' Nikon DSLR to Brands Hatch for 2016 Lotus Weekend so huge choice of colour programs for shooting, but also variable after shooting dependent on whether printing on paper or viewing on screen, and what screen, etc, etc ... so here's a small crop of a bigger photo. Definitely it is affected by screen and camera. I am not an expert for photos but I can recognize KIA Elan has more "PERL" wherein. 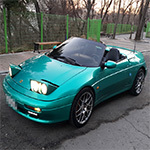 lotusflasherman wrote: Chris, just noticed your Kia Elan has a really dark tint to the windscreen that would probably be illegal in UK. Is that how Kia made them and do the side windows have the same tint? Well, in Korea tinting is allowed even in the front windshield. However, I heard there is a regulation that from 10m driver's face can be recognized in the daytime. For factory built windows are all non-tinted so that people prefer after-market tinting films. V-Kool, SKC, 3M, Huper-optic, Lumar,etc. are major tinting brands in the market. What's that lady doing anyway ? Is she holding something ? Your photo has an Adobe RGB (1998) color scheme. That setting on your camera is better for printing on a good quality printer or displaying on a very high end screen, but not a great choice to display it on a regular screen or print it in a random minilab because most screen and most minilab can't cope with the larger range of colours allowed in the Adobe RGB colour space. I suggest you should set your camera to a sRGB colour space. Then, even when you save your photos in sRGB, there is an associated profile to tell the program how to interpret the colours as a guide to display them. The problem is that some programs ignore the embedded colour profile info, and as a result don't display exactly the required colour. Of course, if you want consistent results, you need to calibrate your screen and printer with a probe ... but of course as most people haven't a screen probe they won't see the same right colours as you anyway!! & just to prove your point, I think that looks more like Aqua than Medina Green.